Officials with the South Dakota State Historical Society announced that the Cultural Heritage Center in Pierre is once again participating in the Blue Star Museums program this summer. 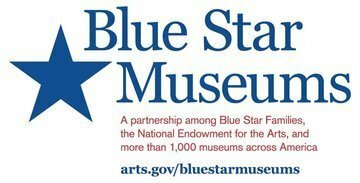 Blue Star Museums is a collaboration among the National Endowment for the Arts, Blue Star Families, the Department of Defense and more than 2,000 museums across America to offer free admission to all active duty military personnel and their families from Memorial Day through Labor Day 2014. Summer hours for the museum in the Cultural Heritage Center are 9 a.m.-6:30 p.m. CDT Monday-Saturday and 1-4:30 p.m. Sundays and holidays. For more information, call (605) 773-3458 or visit www.history.sd.gov. This year, more than 2,000 (and counting) museums in all 50 states, the District of Columbia, Puerto Rico and American Samoa are taking part in the initiative, including more than 450 new museums. Museums are welcome to join Blue Star Museums throughout the summer. The effort to recruit museums has involved partnerships with the American Alliance of Museums, the Association of Art Museum Directors, the Association of Children’s Museums, the American Association of State and Local History and the Association of Science-Technology Centers. This year’s Blue Star Museums represent not just fine arts museums, but also science museums, history museums, nature centers and 75 children’s museums. Leadership support has been provided by MetLife Foundation through Blue Star Families. The complete list of participating museums is available at www.arts.gov/bluestarmuseums. The South Dakota State Historical Society is a division of the Department of Tourism. The Department of Tourism is comprised of Tourism, the South Dakota Arts Council and the State Historical Society. The Department is led by Secretary James D. Hagen. The State Historical Society, an Affiliate of the Smithsonian Institution, is headquartered at the South Dakota Cultural Heritage Center in Pierre. The center houses the society’s world-class museum, the archives, and the historic preservation, publishing and administrative/development offices. Call (605) 773-3458 or visit history.sd.gov for more information. The society also has an archaeology office in Rapid City; call (605) 394-1936 for more information. Blue Star Museums is collaboration among the National Endowment for the Arts, Blue Star Families, the Department of Defense, and more than 2,000 museums across America. The program runs from Memorial Day, May 26, 2014 through Labor Day, September 1, 2014. The free admission program is available to any bearer of a Geneva Convention common access card (CAC), a DD Form 1173 ID card, or a DD Form 1173-1 ID card, which includes active duty U.S. military - Army, Navy, Air Force, Marines, Coast Guard, as well as members of the National Guard and Reserve, U.S. Public Health Service Commissioned Corps, NOAA Commissioned Corps - and up to five family members. Please see the chart of the acceptable IDs (PDF). Some special or limited-time museum exhibits may not be included in this free admission program. For questions on particular exhibits or museums, please contact the museum directly. To find out which museums are participating, visit www.arts.gov/bluestarmuseums. The site includes a list of participating museums and a map to help with visit planning. Other museums that wish to participate in Blue Star Museums may contact bluestarmuseums@arts.gov, or Wendy Clark at 202-682-5451. Blue Star Families is a national, nonprofit network of military families from all ranks and services, including guard and reserve, dedicated to supporting, connecting and empowering military families. With our partners, Blue Star Families hosts a robust array of morale and empowerment programs, including Books on Bases, Blue Star Museums, Operation Honor Corp, Blue Star Careers and Operation Appreciation. Blue Star Families also works directly with the Department of Defense and senior members of local, State and Federal government to bring the most important military family issues to light. Working in concert with fellow nonprofits, community advocates, and public officials, Blue Star Families raises awareness of the challenges and strengths of military family life and works to make military life more sustainable. Our worldwide membership includes military spouses, children, parents, and friends, as well as service members, veterans and civilians. To learn more about Blue Star Families, visit http://www.bluestarfam.org.